Add the raspberries to a medium saucepan, cover, and cook over medium heat. Stir them often as the liquid releases. After the raspberries have broken down to a puree (about 15 minutes), stir in the honey and pectin. 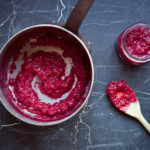 Reduce the heat to low and let the mixture simmer gently, stirring often, until it has a jam consistency, about 15 minutes. Ladle the jam into 1-cup jars and let them cool before sealing. They will store in the refrigerator for up to 6 months. Alternatively, process the raspberry jam in a hot-water bath for 5 minutes. It is best when consumed within 12 months of canning.